Everyone loves a savvy saver, not least us, but it’s always a tough one when you have to prioritise between saving for a rainy day and getting a new pair of sneakers. Something we baked into the app early on was a special pot for stashing some cash away to make it all a little more painless named Save. 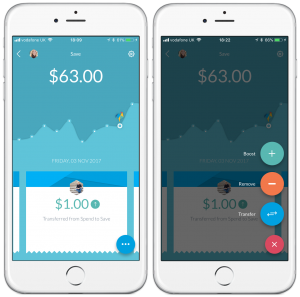 Whereas the Goals feature helps focus saving on specific items like a new pair of roller skates, a mega Lego set or pony lessons, Save is for a rainy day or just general under-the-mattress saving. 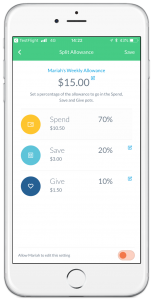 You can also set up Split Allowance so a percentage of money in automatically goes into Save. Something that would be pretty handy on our own bank accounts too! You can set a % of the weekly allowance to go straight into the Save pot without the temptation to put it in any other goals. 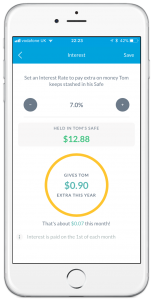 Banks may be boring when it comes to the interest rate they offer but if you’re a PLUS user, you can set an annual interest rate for your kids and play the benevolent banker. So whatever they stash in Save will earn them a bit extra. We’ll let you know when that happens and you can check to see what the Bank of Mum and Dad is paying out. 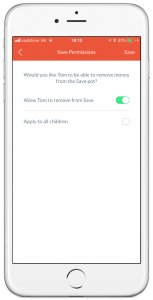 If you want to prevent a run on the bank, you can also change the Save pot permissions for your kids, allowing them to move pocket money from Spend directly into Save but prevent them from taking it out. Because everyone knows that sometimes its tempting to get that little thing you wanted!